AL1012ULXPD16CB is a multi-output power supply/charger that converts a 115VAC, 60Hz input into sixteen (16) 12VDC Class 2 Rated power limited outputs. Input 115VAC, 60Hz, 2.6 amp. Input fuse rated @ 5 amp/250V. 10 amp continuous supply current. 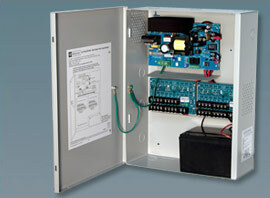 Eight (8) Class 2 Rated PTC protected power limited outputs. Outputs are rated @ 2.5 amp. Maximum charge current 0.7 amp.